Plan a romantic Gettysburg, PA honeymoon or Pennsylvania romantic vacation at Battlefield Bed and Breakfast Inn Gettysburg, PA. Romance packages in Gettysburg. Our Anna's Garden room, a perfect choice for a romantic getaway or a honeymoon. Our picture perfect property is the ideal place to start your life together as a couple on your honeymoon. 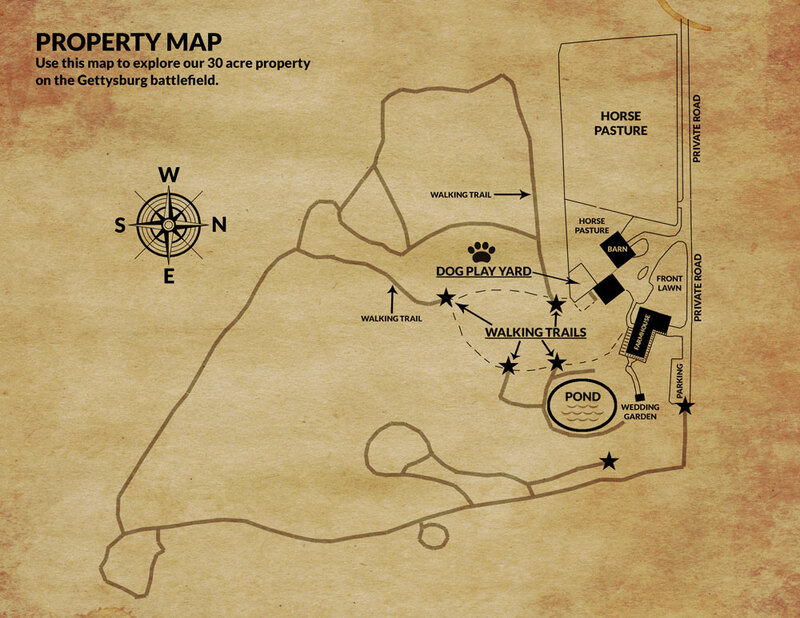 Battlefield Bed and Breakfast Inn is situated on thirty acres of beautiful nature preserve on the South Cavalry Battlefield in historic Gettysburg, PA. When booking your Pennsylvania honeymoon you have twelve rooms to choose from, each room with it's own unique character and charm. Preferred rooms for honeymoons and romance include: The Tack Room - built inside of a circa 1810 barn, Swan Cottage - a private romantic honeymoon cottage, Anna's Garden - a romantic bridal suite, Houghtelin's Hideaway - a romantic groom's suite, and General Merritt's Suite - the entire upstairs floor of the 1809 farmhouse with a romantic gas fireplace. The Inn has many romantic features that are a must-have for honeymoons, such as: common rooms with gas fireplaces, a large outdoor deck with a view, furnished outdoor areas with places for picnics, walking trails, and friendly farm animals. Start planning your romantic Gettysburg, PA honeymoon getaway today! Call 1-717-334-8804 to speak with the Front Desk about honeymoon and romance packages. Romantic Rooms, Romance Packages, Walking Trails, Adams County Wine and the Charming town of Gettysburg, PA. Romantic rooms with King sized beds are the perfect setting for your enchanted honeymoon in Gettysburg, PA. Houghtelin's Hideaway (pictured above) also has a private entrance. We have rooms with extra large rain showers, double soaking tubs, Jacuzzis, and unique romantic features such as a stone facade in the Houghtelin's Hideaway bathroom (pictured above). We offer breakfast served inside your room. When booking your honeymoon please call the Inn to place a request for breakfast served inside your room daily. Our 30 acre property on the Gettysburg battlefield has walking trails for long private walks with your beloved on your Gettysburg honeymoon or romantic getaway. A bottle of local Wine, a cheese, fruit, and bread tray including four chocolate dipped strawberries, a bouquet of fresh flowers, and breakfast served inside your room for your honeymoon. Taste Adam's County's local wines, beers, ciders and spirits on the Adams County Pour Tour. From 1700's period fare to modern fine dining, Gettysburg Pennsylvania has many romantic restaurants that are perfect for romance & honeymoons. Gettysburg Day Spa offers a wide range of Spa treatments for both men and women. Nothing sets the mood for romance quite like a relaxing day at the spa.